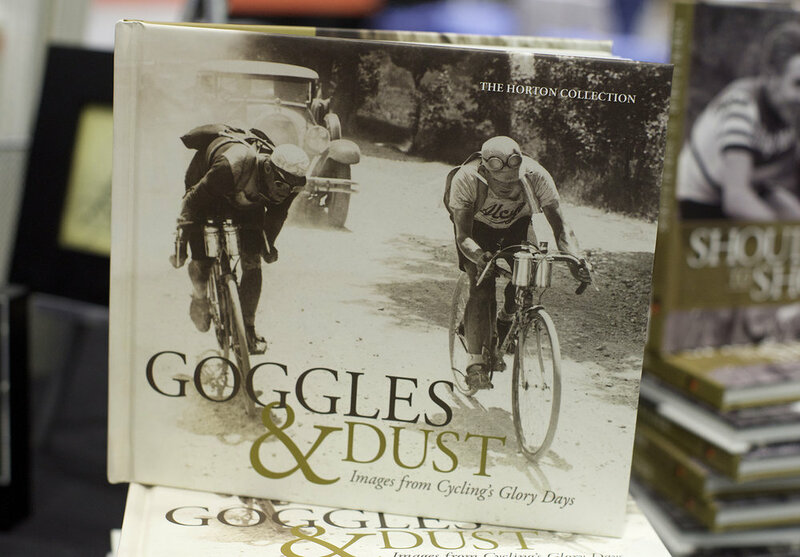 Review | This slim volume of photographs from the collection of noted cycling ephemera collectors Brett and Shelly Horton shows the world of European bicycle racing before the Second World War. That is a pretty dry, but accurate, description of a book that punches far above its weight. The Hortons found that their photographic collection itself took on a life and meaning of its own. And it is hard not to see why. The photographs are so engaging and evocative. I have looked through this well-laid-out book many times and still find that if I pick it up I can open it to any page and be captivated by the amazing black and white images. The majority have not been seen since they appeared in the periodicals and newspapers of the time. From a photographic standpoint the images are quite good, and many stand out as works of art in their own right. The bicycle racing scene in Europe was culturally important in the ’20s and ’30s. Far more than most people realize these days. It was every bit the equal of (or more important than) motorcycle or car racing, soccer, fashion or film. People would dress in their finest clothes to go watch a race. They would clean up and decorate their village if a stage was going to pass through. Huge crowds turned out to watch races. Ever since the 1880s cycling and bicycle racing had been very popular in Europe, and it was not until after the recovery from the Second World War that the automobile became widespread. In the ’20s and ’30s the bicycle was the most common form of personal transportation. Cycling contributed to many of the social changes that moved Europe from the 19th century into the modern age. The photos in “Goggles & Dust” give a glimpse of how society changed as the years went by. People dress better, towns and cities get cleaned up and roads get paved as the photos move from the teens to the eve of World War II. Post World War I, cycling helped bring sporting fans in the war-torn countries together in a common pastime. Cycling was big business in the newspapers of the day but the riders paid a brutal price. When we think of bicycle racing nowadays we think of flashy jerseys, high-tech nutrition and space-age bikes ridden by hyper-fit athletes. In the poverty-stricken years between the wars, things were much more basic and gritty. Riders were allowed only two jerseys for the season, there was no study of sports nutrition, and racing bikes of the day had only one speed. In fact, the Tour de France specifically banned multiple gears. Another thing you notice when studying these photographs is that many of the roads were dirt or gravel. There were very few kilometers of paved road, especially in the brutal mountain stages. Races were held over roads that would be more appropriate to a mountain bike race today. There is a photo of Paul Egli and Maurice Archambaud at the finish of stage 1 of the 1936 TDF in which they are riding in a torrential downpour through about eight inches of water. Bicycle racing has always been about suffering. All things being equal, riders who can push themselves the hardest and longest will be the winners. That is one of the strongest messages of this book. The haunted look on the faces of these men as they ride is quite poignant. Often riders had to be held up so they could stand for photos after the finish of a race. These were men of iron will. If you love cycling this is a must-have book. If you are a student of history or a lover of photography you will also be fascinated by this wonderful collection of photographs. —m. b.